And boy, does he love doing it! Nothing excites him more than finding yet another judger declaring how everybody is entitled to their opinion. It sets his wings a flitter and his eyebrows a twerking as he gets to write down their names in his book. Fortunately for him, the judgmental aren’t hard to find. They won’t be labeled by gender, philosophy, politics, wealth, location or education. In every walk of life, there are those convinced of the inferiority of other people’s views, ideas and lifestyle choices. Everywhere people wag fingers, criticize and demonize those they don’t know but completely understand. And of course, the judger knows best! After all, they have a monopoly on the truth, given to them by their sense of moral superiority (or personal uncertainty). Why bother to consider situation, circumstance or surroundings? With a jerk of the mind’s knee, they place blame at the feet of inferiority and fundamental character flaws. They are poor because they are lazy. They do nothing for the environment because they are selfish. They disagree with me because they are short-sighted and evil. People get the government they deserve. She invited it by wearing such revealing clothes. In fact, the more extreme the mental idleness and lack of empathy the more excite the Judgment Fairy becomes. And when he finds a truly sanctimonious superstar he’ll give it that extra touch. He’ll grab his wand and spray his fairy dust all over them. He’ll bathe them in his sticky rainbow that raises voices and tempers all around. Don’t let that happen. Don’t let somebody carry around this judgment fairy stain. There is already enough conflict in this world. Instead, make the internet a more tolerable place. 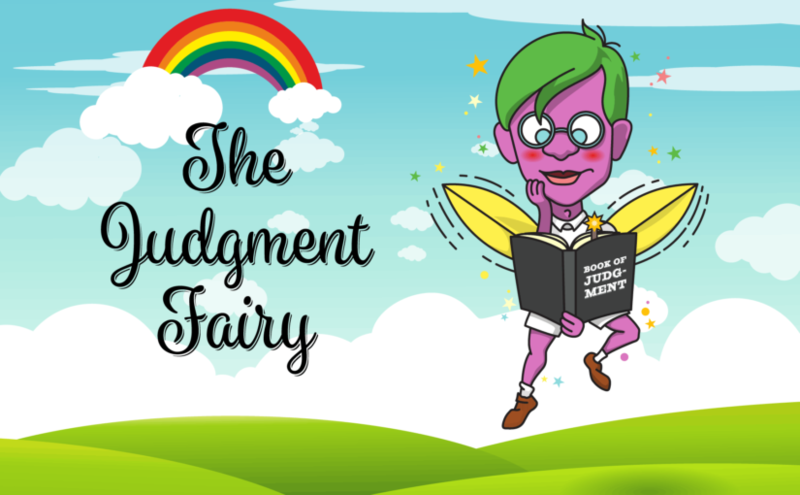 Point out the hovering Judgment Fairy when people are becoming judgmental. So people can avoid his mark. Sounds great, right? So go on! Put it up! It’s easy. All you need to do is copy the link and put it into any online discussion. The internet will do the rest. It will put up the picture and from there everybody else will be able to see the judgment fairy as easily as you can. And remember, whenever you see one, even if you put up the link, take a moment to reflect and to wonder. For as uncomfortable as it may be, in most discussions, he doesn’t write down just one name.